A traveling bard tells the story of how legendary warrior rabbit Podkin lost his ear and confronted the treacherous Gorm. When rabbits walked upright and lived in elaborate underground villages, Podkin “was perhaps the laziest, most spoiled son of a chieftain in the whole Five Realms.” One Bramblemas Eve, the Gorm—mutant, evil, iron-infused, red-eyed rabbits—invade Munbury Warren searching for Starclaw, a magical knife. While the Gorm murder his father, Podkin flees with his sister, brother, and Starclaw. With the Gorm in pursuit, the siblings barely escape (Podkin sacrificing his ear in the process) and are rescued by an ancient rabbit healer/seer who seems to know everything about them. She sends them to an underground warren of other refugees from the Gorm, where they find allies, but can Podkin, now chieftain of Munbury Warren, hope to avenge his father and rescue his mother from the seemingly invincible Gorm? 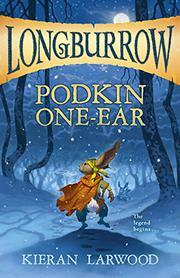 An omniscient third-person narrator speaks directly to readers, inviting them to listen to the mysterious storyteller who relates Podkin’s gripping tale in language replete with amusing asides, rabbit lore, stories within stories, and a curious insider perspective. Realistic black-and-white illustrations highlight dramatic scenes.